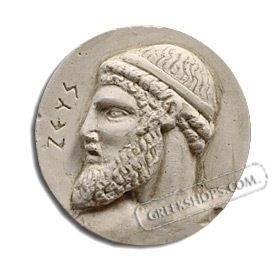 In Greek mythology, Zeus is the king of the gods, the ruler of Mount Olympus and the god of the sky and thunder. His symbols are the thunderbolt, eagle, bull, and oak. In addition to his Indo-European inheritance, the classical "cloud-gatherer" also derives certain iconographic traits from the cultures of the ancient Near East, such as the scepter. Zeus is frequently depicted by Greek artists in one of two poses: standing, striding forward, with a thunderbolt leveled in his raised right hand, or seated in majesty.